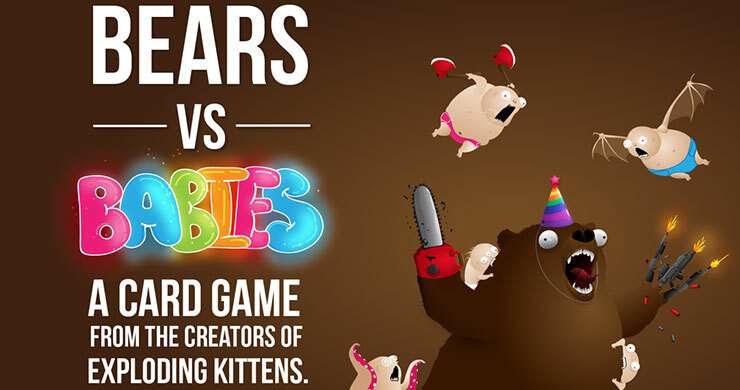 Coming from the creators of “Exploding Kittens”, an almost 9 million dollars campaign, and the Oatmeal we have “Bears VS Babies”. A card game for up to four players in which you will create a powerful army of crazy looking monsters in order to fight an abominable baby army! The gameplay is quite easy; in turn order each player will draw a card from the main deck. There are two types of cards, Bears and Babies. Bears are built in front of you and come in the form of torsos, heads, legs, and arms. Babies are placed immediately at the center of the table, forming an army. With a great amount of possible combinations, players can create creatures beyond imagination and equip them with powerful tools and weapons. Players fight the Babies by provoking them with cards starting a war of eat or be eaten. In that quirky take-that game the player who manages to eat the most Babies wins! The theme is extremely strange but follows the aesthetics of Exploding Kittens making a great fit for their slowly expanding line of games. It seems like a funny and very light card game and it already has more than 48,000 backers which pledged more than 1.8 million dollars which is pretty impressive. If it picked your interest you can back the project through it’s Kickstarter page.